Gradall’s XL 4100 V excavators, with a Tier IV-Final compliant Volvo Penta engine, can be driven up to 60 mph. Gradall's XL 4100 V hydraulic excavator features a Tier IV-Final complaint Volvo Penta diesel engine, meeting the highest global standards including the demanding Stage IV (EU) and Tier IV Final (U.S.) emission requirements. In addition, fuel efficiency is improved by up to 5 percent. 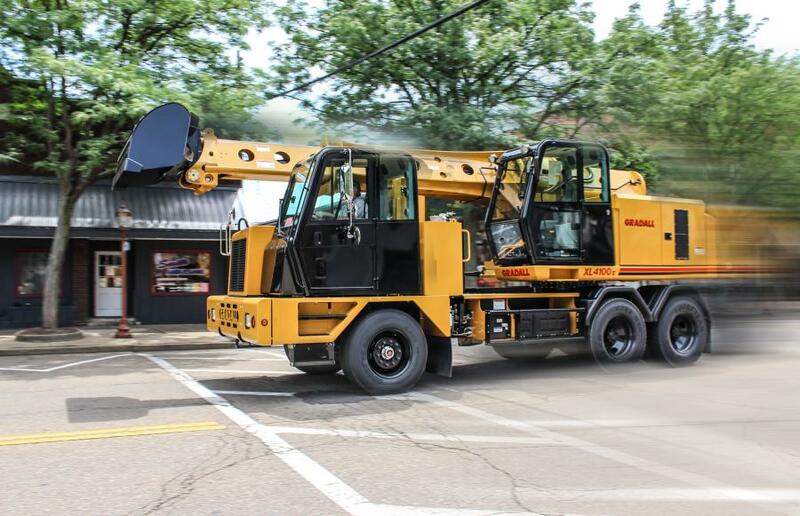 The single engine is designed to power excavator travel up to 60 mph on highways, or 5 mph for repositioning around job sites from the upperstructure cab. The same engine also powers the upperstructure boom, including swing motions as well as the famous Gradall telescoping, tiling boom movements. The advanced hydraulic system has pressure-compensated, load-sensing valves with reliefs on all circuits, delivering the right amount of hydraulic power to the boom. This system increases cost-efficiency while performing conventional excavator digging, demolition and barrier placement as well as sloping, finishing, storm and canal cleanup, tree trimming and many other jobs using a host of attachments. Along with the new engine, Series V excavators include an upgraded high-performance, high-reliability 24-volt electrical system, creating a better power source. An operator cab safety option provides rollover protection that meets safety test requirements and is integrated within the existing cab structure, without external support. The XL 4100 V has a host of mobility advantages including highway travel speed capability, eliminating the expense, time and manpower needed to transport excavators with an extra truck and a lowboy trailer. At the end of the day, the XL 4100 V models also can be quickly driven back to the safety of the equipment yard. The excavator's ease and speed of mobility is one feature of the Gradall AutoDrive package that includes a push-button automatic transmission — standard equipment that makes travel easier on city streets, interstate highways or on off-the-grid roads. Maximum boom reach is 30 ft. 3 in. (9.2 m) at grade, while maximum dig depth is 20 ft. 3 in. (6.2 m). Loading height maximum is 17 ft. 2 in. (5.2 m). Rated bucket force is 24,900 lbs. (111 kN) while the telescoping boom crowd force is 21,940 lbs. (97.6 kN). Unlike conventional excavators, the telescoping boom forces are constant through the entire dig cycle. Series V machines have almost 70 percent parts commonality, simplifying the task of maintaining inventories to complete common service functions. These machines also have longer routine service intervals, and most service locations can be reached from ground level. A global network of authorized distributors supports all Gradall excavators, supplying service expertise and authorized Gradall parts. For more information, call 330/339-2211 or visit www.gradall.com.